For the most part, learning pinyin has come pretty intuitively and with little effort. But there are some consonants and vowel combinations that are a little tricky, and some sounds that are awfully similar to me. 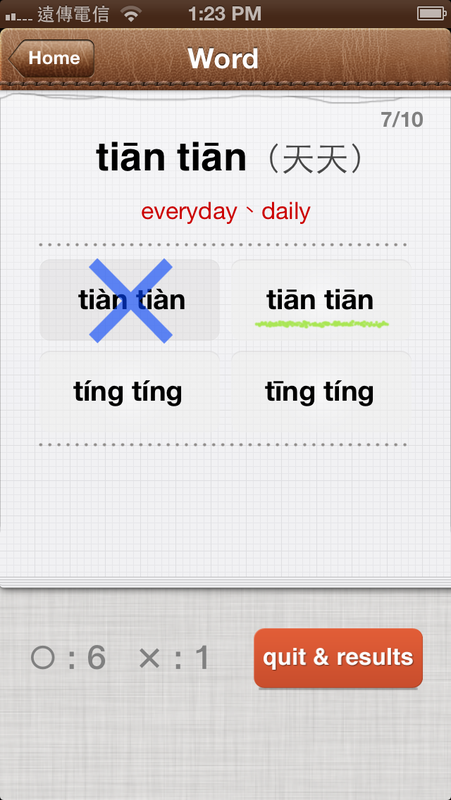 I often use the Pinyin Chart app when I need to reference certain sounds in pinyin. But it is more of a reference tool than an active study guide. Recently I found an app called Chinese Pinyin Game (Pinyin Master) by Albatrus. They call it a game, but it is more like a series of short quizzes. The audio is a real native speaker, not an artificial computer generated voice. The pronunciation is clear and standard. 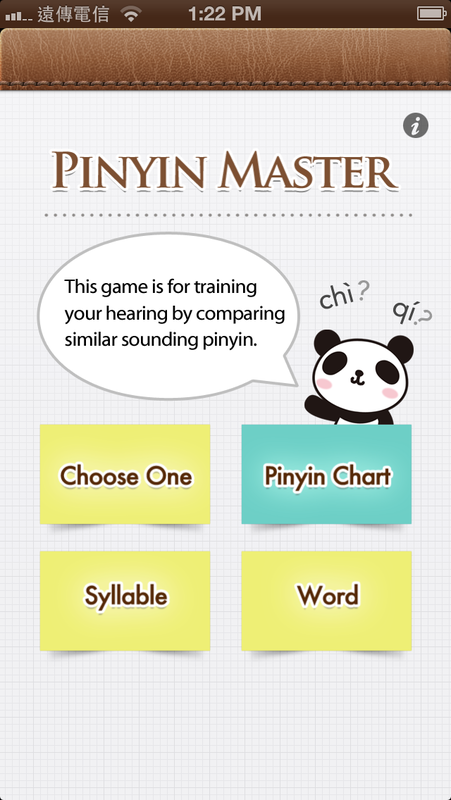 To train in both listening and reading pinyin, the app speaks a word and you must select the correct pinyin from two or four choices, depending on the type of quiz you choose. There are three different types of quizzes you can choose from, depending on how you want to focus your practice. I like the Word quizzes best, because after you select your answer, it shows the Chinese characters along with the English translation. 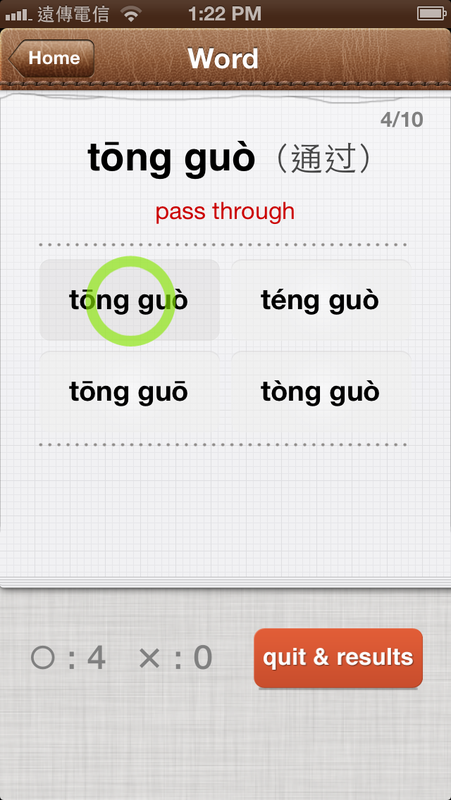 It is a great way to practice both tones and pinyin at the same time. The quizzes are ten questions long, and give immediate feedback if you answer correctly or not. At the end of the quiz there is a summary and a score. I found that after doing only about four quizzes my scores were improving and I was able to distinguish the tones and pronunciation better. And I was enjoying it! I really like this app. It is easy to use, it also features a pinyin chart, it is clean and free of advertising. Incredibly, this app is free! Try it out and let me know what you think! photo credit: She Fancies IT. In Taiwan, like many of its neighboring countries, eyes play a central role in beauty, right up there with light skin color and slim legs. Large, round eyes are considered feminine and beautiful in Taiwan, as well as in other East Asian countries. For many Taiwanese women, their routine beauty regime consists of enhancing the eyes, not only with makeup but eyelid glue or tape, false lashes, and circle contact lenses. For women with monolids, tape or glue can be applied to the eyelid to create the appearance of a double fold eyelid. This makes the eyes look larger and slightly rounder. Surgery is another popular option. False eyelashes are commonly worn and contribute to the illusion of larger eyes. Additionally, circle contact lenses are also worn, creating the illusion of a larger iris, which is considered beautiful. Sometimes the contact lenses are also colored, to give the appearance of slightly lighter eye color. The overall effect is thought to be sweet and innocent, reminiscent of Japanese anime and magna. 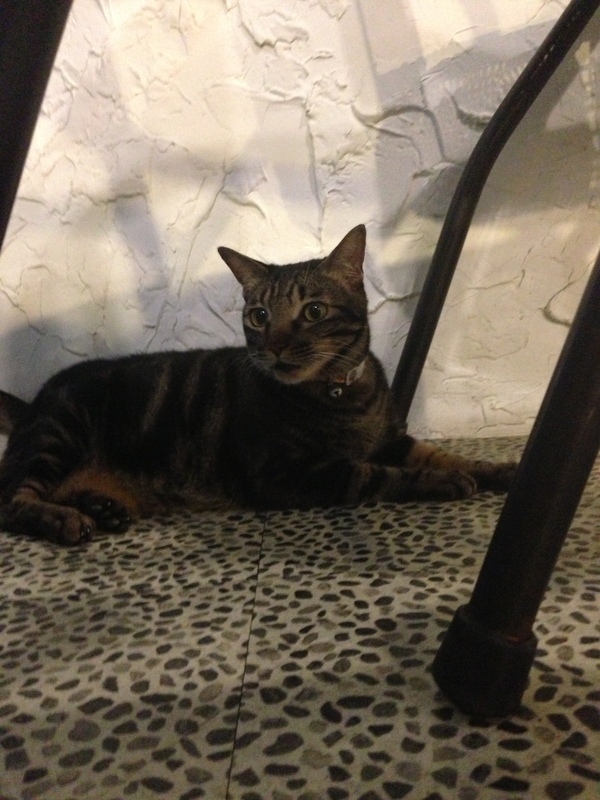 This little buddy lives at a local vegetarian restaurant in my neighborhood, and likes to mingle with the customers. How do you say customer in your target language? What Is Cat Look Book? Welcome to Cat Look Book, a new page dedicated to candid snapshots of cats around town. What does this have to do with immersion language learning? But it’s a well established fact that cats are an internet sensation, so to jazz up Language Boat I will be featuring photos of cats I encounter along with a vocabulary word, just for fun. These posts occur spontaneously whenever a cat photo op presents itself. Enjoy! Once you have decided on learning a new language, what is the next step? Whether you choose formal study or learning on your own, I strongly recommend starting with listening. Listening is an essential but often overlooked element of language learning. Listen for the shape of sounds, rhythm, and cadence of the language. Listen for and identify patterns and repeating words. Observe the speaker’s facial and mouth movements and nonverbal gestures when speaking. Listen for and identify repeating filler sounds, the equivalent of um and uh-huh in English. If possible, identify the context of what you are listening to. What is the speaker talking about in general? Look for visual cues while listening. While listening, observe the speaker’s emotions and attitude. Listen to a variety of material, including natural conversations, news reports, songs, tv dramas, game shows, interviews, documentaries, and stories. At first a new language may sound like noise and individual words may not be distinguishable. But through focused listening over time you will begin to discover repeating patterns and words will emerge. Spend time listening regularly. There is a wealth of information available about a language when you listen with focused attention.